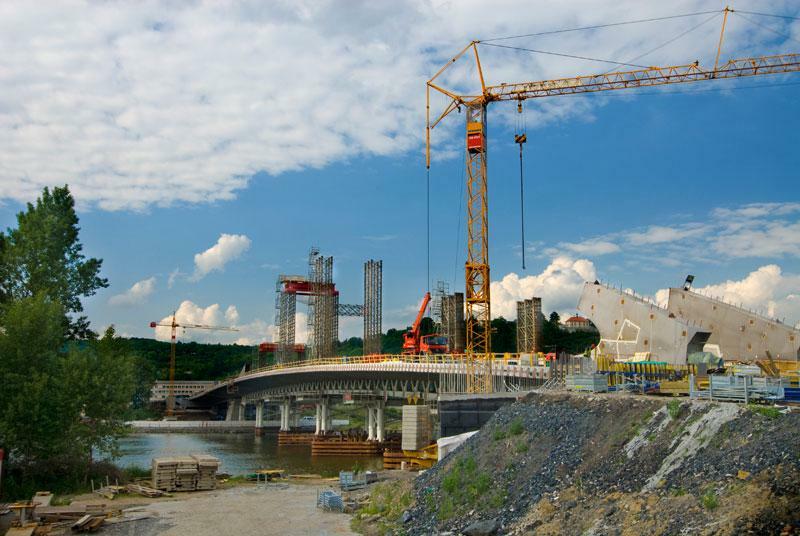 Work began on building the new Troja Bridge across the Vltava in Prague in 2010. The crossing has spans of 200.4 and 40.4 m. The new bridge is part of the Prague inner orbital route and links the districts of Holešovice and Troja. The innovative nature and low structure tolerances called for some custom solutions in terms of the formwork used. The challenge was to do with the fact that the construction has to fulfil extremely stringent criteria regarding fair-faced concrete and accuracy. For centuries, the bridges of Prague have characterised the appearance of the ‘Golden City’. The foundation stone of one of the oldest and most famous bridges in Europe, the Charles Bridge, was laid in 1357. The modern-day counterpart to this prestige project by the late mediaeval emperor Charles IV. is the high-tech concept of the 262 m long Troja Bridge: The crew from contractors Metrostav are pouring each concreting section in the formwork of special Doka tableforms – a concept proposed by the engineering team at Česká Doka in close collaboration with the project managers for the bridge and of the construction firm. The custom tableforms are made up of WS10 steel secondaries, H20 top timber-beam primaries, profiled timber formers and 3-S eco formwork sheeting. The working platforms under the tables are assembled from the Load-bearing tower Staxo 40 system. The tableforms were lifted into place from river-barges with the aid of four hydraulic cylinders. Special brackets held the tableforms in the correct position for pouring, after which they were lowered back down onto the barges. 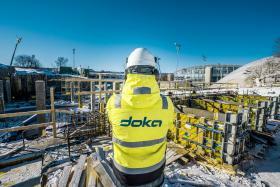 The formwork for the tables, piers and abutments was prepared by the Česká Doka Ready-to-Use Service. After it is completed at the end of 2013, the new bridge across the Vltava will have space for motor-vehicle, passenger-tram and pedestrian traffic. Thank you for your interest - A new bridge over the River Vltava. Thank you very much for your interest - A new bridge over the River Vltava.